If you want to raise your queen bed you can lift it and place various objects underneath it. A better option is to use a set of bed risers for a queen bed to lift it. Bed risers aren’t expensive and they’re easy to use making them a practical solution for lifting a bed. I have a condition called lymphoedema which results in my left leg being swollen and the only treatment is compression and elevation. At night I elevate my bed and I used to do this by putting a few pillows under the mattress. I now elevate the foot of my bed with a pair of 5-inch bed risers and this is an effective way to manage the swelling. Stackable to give three height options. Supports up to 2000 pounds. Set of eight adjustable bed risers. Who Needs to Use Bed Risers? If you find it difficult to get in or out of bed you can benefit from lifting the bed with a set of bed risers. The extra height means that you’ll not have to struggle to get in and out of your bed. A raised bed is particularly useful for the elderly, disabled people and those who suffer from arthritis. Many people also use bed risers following hip and knee surgery to make getting in and out of bed les strenuous. 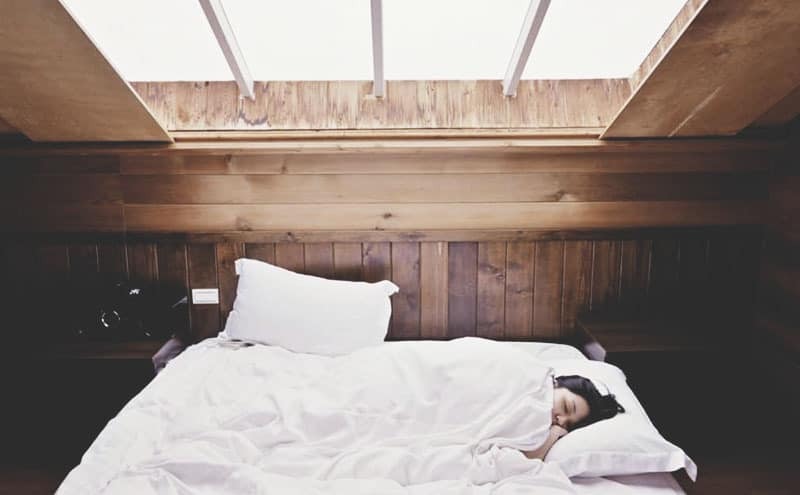 Extra height will protect your joints when getting in and out of bed until you’ve recovered from the surgery. Putting stress on joints that have been operated on can slow down the healing process or cause further injury. You can also use bed risers for lifting one end of the bed which is particularly useful if you need to elevate your legs and feet. Elevation can help people with back or neck problems and it reduces swelling in the lower limbs. If you watch TV whilst in bed it may also be more comfortable to lift your bed with a pair of risers. You can also use a set of bed risers to lift your bed to create some extra storage space in your home which you may find useful. Many beds are close to the floor and the space underneath is wasted. By lifting your bed you can create a convenient space to store various items such as boxes, clothing or luggage. As well as lifting a bed you can also use bed risers to raise the height of chairs, sofas and tables. If you have trouble getting out of a chair for any reason a set of risers may be useful. How Do Bed Risers Work? Bed risers are a simple way to raise the height of your bed to make life easier. Bed risers are either square blocks or round cups with a recess in the top to accommodate the bed leg or caster. You need to lift the bed at each corner and place the bed riser under the leg or caster. Bed risers also help protect wooden or vinyl bedroom floor coverings by distributing the weight of the bed. Castors can sometimes dent hardwood or laminate flooring or leave an indentation in vinyl floor coverings. Protecting your floor with a set of bed risers will keep the floor looking good and it’ll last longer. Bed risers may also stop your bed from moving around on hardwood, laminate and vinyl floors. The casters on a bed are designed to make it easy to move but when the casters are sitting in the bed riser recess they can’t. Stabilizing the bed is safer and particularly useful for the elderly and people with limited mobility. How Do I Choose Bed Risers for a Queen Bed? Before you buy bed risers you should work out how high you need your bed to be so that you select the correct product. Some of the bed risers are adjustable and others are a single size. Adjustable bed risers that stack to give different heights are a good option as they give you more flexibility. Look at the dimensions of the base of the bed risers to ensure they’re large enough to distribute weight. If the base of the bed risers is too narrow they won’t distribute the weight. This may then result in the bed risers cracking or collapsing which may cause injury to you or damage to the bed. You should also look at the weight that the bed risers can take so they support the bed and the people in it. Some beds are heavier than you’d imagine and you also need to consider your bodyweight. If your bed risers can’t take the weight of your bed they may break, which obviously needs to be avoided! You should also look at the bottom of the bed risers to make sure there’s some kind of grip. Many bed risers have rubberized bases which prevents them from sliding around. The grip on the base of the bed risers also helps to protect hardwood, laminate and vinyl floor coverings. Buy a set of bed risers that are well made with strong materials so that they’re durable. A poorly made set of bed risers will not last and they may also fail after a period of time. Reinforced plastic is often used and this material is hard wearing and will also take the weight of the bed. Check the height of the bed risers. Look at the dimensions of the base. Check how much weight the risers can take. Buy bed risers with some grip. Ensure the bed risers are well made. What Are the Best Bed Risers for Queen Beds? We’ve looked at a range of bed risers that are suitable for lifting queen beds. The main things we looked at are price, quality, height options and the strength of the bed risers. We’ve reviewed five products and have highlighted some pros and cons for each one. This eight-piece set of adjustable bed risers made by Home-it is suitable for supporting upto 1300 pounds of weight. These bed risers are made from materials that are suitable for carpeted or hardwood floors, and give you three height options to lift the bed 3, 5 or 8 inches off the floor. People who used these bed risers were impressed with the amount of adjustment they provide. Customers said that the bed risers can accommodate even the largest of bed legs unlike other products they’d used. A few customers also said that these bed risers didn’t move around once in place. 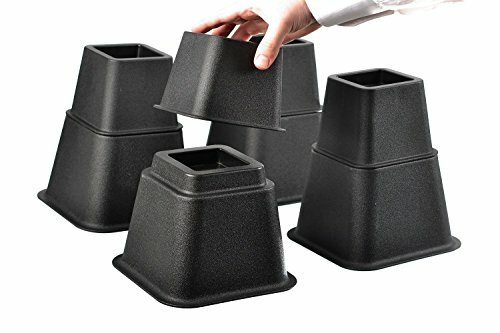 Some customers who purchased these bed risers claimed they broke after using them for only a few days. Others said that when they stacked two of the the bed risers to get the 8-inch lift they weren’t very stable. Customers also said that the plastic used to make the bed risers is very thin. Large recess for bed legs. 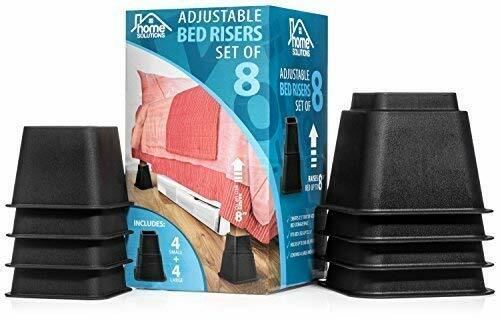 These premium adjustable bed risers made by Home Solutions are sold in packs of eight and they’re suitable for raising queen beds. The sturdy plastic risers can be used on most types of floor and can accommodate bed legs up to 2.75 inches wide. You can use the bed risers to lift a bed either 3, 5 or 8 inches by stacking them. Customers who used these bed risers said they’re well made with quality materials making them durable. People liked the fact that when the bed risers are in place they don’t move around on hardwood floors. Customers also said that the bed risers are versatile and can be used to lift tables, chairs and desks. Some customers who purchased these bed risers commented that they have an unpleasant odour when brand new. A number of people claimed the bed risers broke after a couple of months of use. And others also said that these bed risers couldn’t take as much weight as other risers they’ve used. The CB650 bed risers by Slipstick are sold in packs of four and can support upto 2000 pounds of weight. 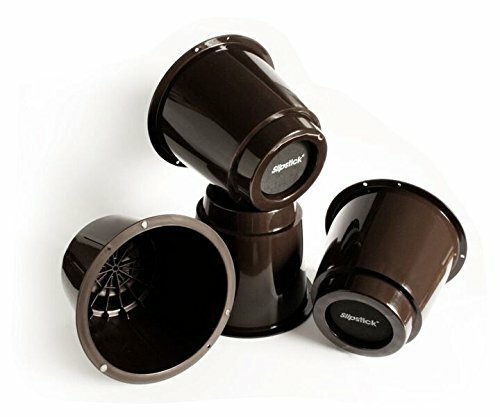 The cup-style bed risers can be used to lift a bed by 5 inches and the cups are 3 inches in diameter. The bed risers have a non-slip rubber base to protect hardwood or vinyl floors and to keep the cups in place. 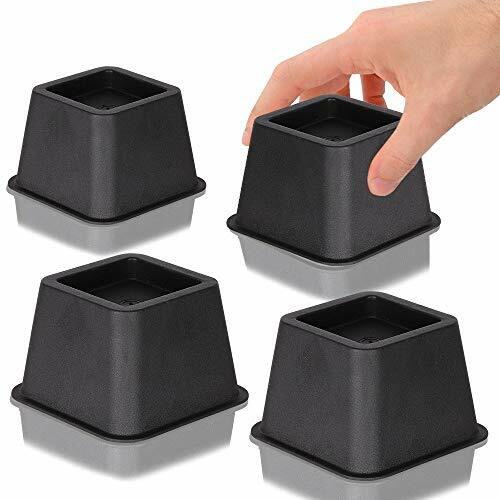 Customers who used these bed risers said they hold their bed securely and the cups accommodate their weight. People were impressed with the level of grip on the bottom of the cups to prevent them from sliding. Customers also said that these bed risers are durable and last longer than other products they’d used. A few customers said that the castors on their bed pierced the top of the cups, others thought the plastic was too thin and they would’ve liked the bed risers to be more sturdy. Some customers also said that these bed risers are too big and unsightly. These bed risers made by DuraCasa can support up to 2000 pounds of weight and are sold in packs of four or six. The reinforced plastic bed risers can accommodate bed legs up to a diameter of 2.75 inches and will raise a bed by 3 inches. They can be used on various types of flooring. Customers who purchased these bed risers said they’re well made and very easy to use. People like the fact that the bed risers can be stacked so that 6 inches of lift can be obtained. Customers also said that the bed risers are sturdy and they supported their bed well. A few customers reported that the bed risers had cracked after they’d been in place for a few weeks. Customers also said that the base of the bed risers wasn’t wide enough and they kept flipping over. A few people also said that the bed risers had scratched their hardwood floor. 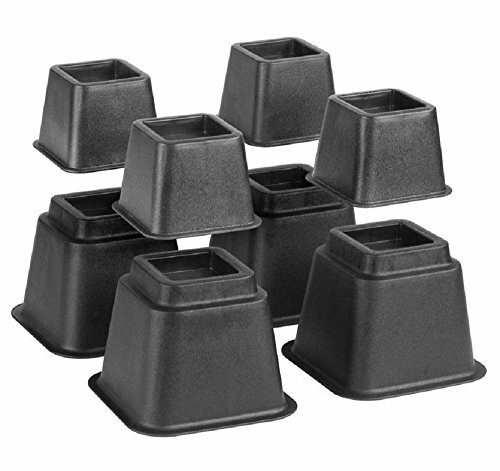 This set of eight bed risers by Katzco is made from heavy duty plastic and can support up to 1200 pounds. The bed risers can accommodate bed posts up to 2.75 inches in diameter and they’re suitable for most floor surfaces. The adjustable bed risers give you three height options which are 3, 5 or 8 inches. People who purchased these bed risers said they’re durable and they supported their bed. Customers said that the bed risers are easy to fit together to get the 8-inch height setting. Customers also said the bed risers are better than some of the more expensive products that are available. Other users who tried these bed risers said that the support where the bedpost sits was weak and had broken after a couple of weeks. A few people said that the bed risers are too big and stick out causing a tripping hazard. Customers also said that these bed risers tend to slide on a hardwood floor. All the bed risers that we looked at are of a similar design and are suitable for raising the height of a queen bed. None of the products are expensive and are all made from similar materials. All the bed risers can support heavy weights and can be used on various types of flooring. After looking closely at each product the best bed risers for queen bed are the Home-it Adjustable Bed Risers. These reasonably priced bed risers are well made and they can support 1300 pounds of weight which should be enough for most users. The bed risers stay in place and can be used on many different floor surfaces. We also like the fact that there are three height options which makes these bed risers versatile.